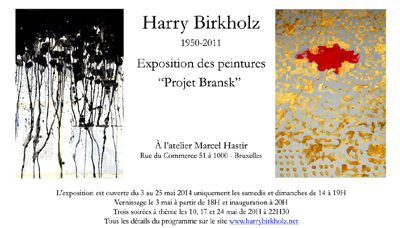 " The Bransk Project "
On the occasion of this retrospective we discovered thirty years of painting by the German artist, Harry Birkholz, a Belgian at heart who said: "I am NYC". 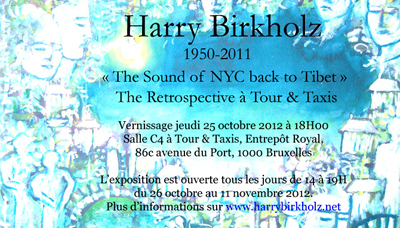 Harry Birkholz had the soul of a true musician and loved NYC, jazz music, avant-garde music as well as Rock & Roll which has its roots in blues music. Harry loved musicians and frequently sketched them while listening to his favorite tunes. Harry had a wide knowledge of music. He was a connoisseur and composed electronic music. We were able to listen to some of his pieces during this exhibition of his artwork. In 1987 Harry created a monumental artwork. He created 49 oil paintings and gained inspiration from the "Tibetan book of the Dead". This work was exhibited for the first time at this exhibition. In Harry's work one can define the spiritual search of an artist who integrated daily meditation. The exhibition was held from October 25th until November 11th 2012 at Tour & Taxis in Brussels. Olivier Kempen made it all possible. 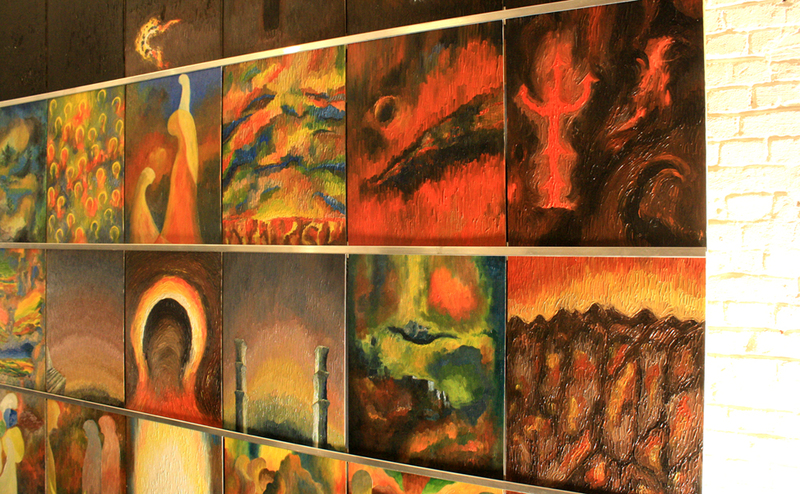 The 49 oil paintings inspired by the "Tibetan Book of the Dead " or Bardo Thödol. Given Harry Birkholz's early interest in spirituality, he has read this text many times. The text speaks about the successive states of consciousness. It delves into the span between the moment of death and the consequential start of a new life. By listening to these instructions during the intermediary states, one can help the dying person and the dead free themselves of the eternal cycle of reincarnation and hopefully reach a higher more enlightened state of consciousness. In a very contemporary manner and in the form of visions which are his own mental projections, the artist translated this inspirational text. This monumental work of art consists of 49 oil paintings on cardboard, placed in a specific order. The work in its entirety measures 286 x 356 cm. Tribute to the Rig Veda: ten books containing 1028 drawings in black or colored pencils, watercolors, acrylic and ink. Harry Birkholz has continuously been reading this classic text of Indian literature since 1978 and has used it as a source of inspiration for his painting. In 2002, Harry began the first of 10 books and presented his entire work relating to this theme on the occasion of the exhibition " Le Journal de la Lumière Lactée " in September 2006 in the L'Usine Gallery in Brussels. My initial idea was to create an imaginary writing which could slowly evolve, step by step from book 1 to book 10. After creating a few pages, a particular dynamic development arose. In the first two volumes, a kaleidoscope of styles and techniques manifested themselves. Then starting from the third book, each volume revealed a different approach. The third book contains 105 portraits of various Vedic deities drawn exclusively in black ink. Various landscapes resembling to states of consciousness comprise the fourth book. In book five, using various ink color, I found myself working in an abstract manner. Occasionally, imaginary writing appears. Latin scripture going from right to left exhibited itself in the sixth volume. This became a characteristic of the following books, as did paintings on canvas and paper. One of the reasons I made these choice was that archeologists and historians agree that the first written traces of the Rig Veda appeared circa 1600 years before J.C. The oral tradition of the rig Veda is pre-dated by a thousand of years. According to our present knowledge, we date the rise of the Indus civilization to the fourth millennium before J.C. This includes with its two Metropolis Harappa and Mohenjo Daro located in which is today's eastern Pakistan. On certain seals discovered there, we see motifs which illustrate scenes from the Rig Veda. These glyphs not yet decoded, should be read from right to left. For this reason I am writing in the form of "mirror image". The sixth book is painted with color pencils. In the seventh book, I only used black pencil. The eighth book contains the ninth mandala. It is entirely dedicated to the elixir of immortality: it is called the soma which later became a manifestation of God. It is described in reddish gold of various aspects. My painting of this considers this volume a union of mystic avant-garde.